Way back in the late 1980's and early 90's, I was a very big stenciler. 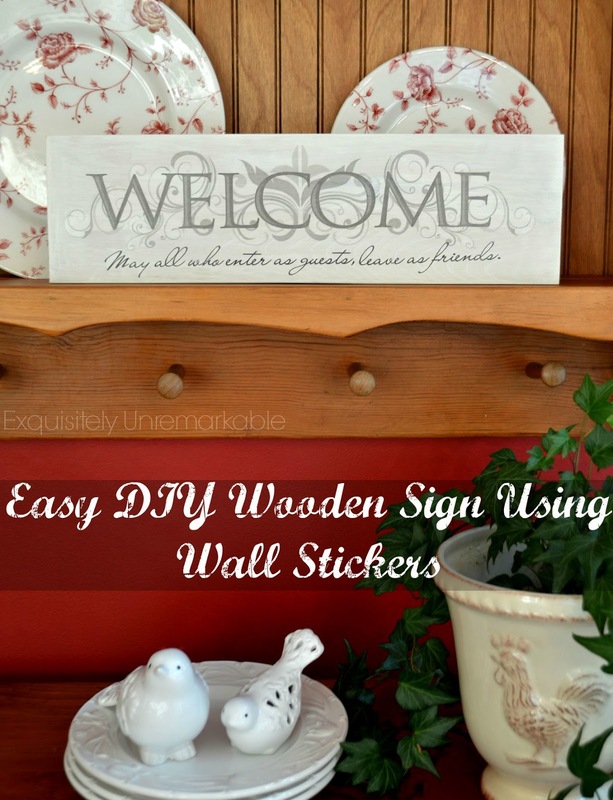 I loved the craft and I went crazy stenciling borders in just about every room of my home and all sorts of decorative items. Recently, I have fallen in love with stenciling again, both inside my home and out. My latest project is a pair of stenciled pillows and I am totally in love. They are a focal point in my fall living room! I have to be honest, I was never a big fan of stenciling on fabric. I could never seem to get very clean lines, the stencil always moved or the material would buckle. So even though I was really fond of the look, I stayed away. Then I received an email from Cutting Edge Stencils regarding their sister company, Paint-A-Pillow. They offered me two pillows and all the accessories I would need to create some unique, custom decor pieces. I was intrigued, so of course, I said yes. There are well over 100 stenciled pillow patterns, all different styles, on their website. 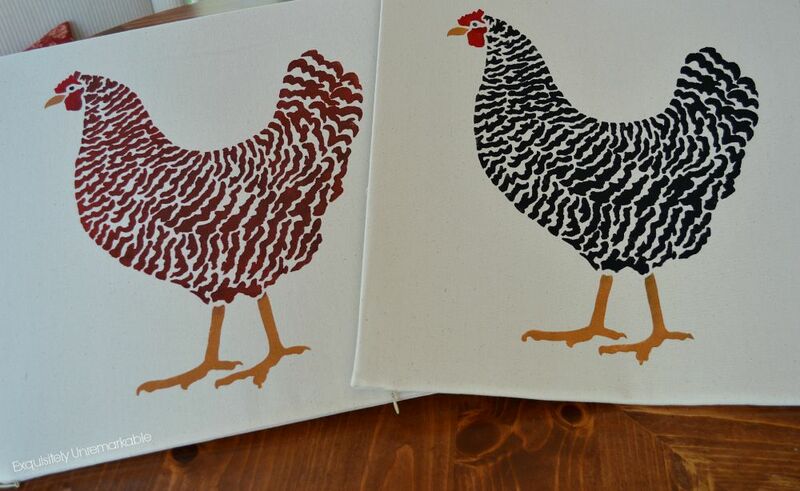 I chose the Dominique Chicken stencils. I kind of have a chicken/ rooster obsession. 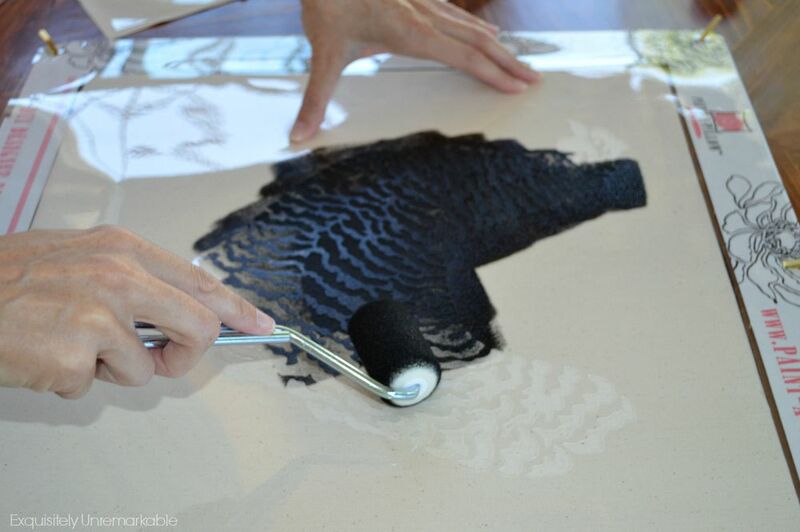 Each kit comes with a pillow cover in your choice of white or natural, a fluffy insert, a stencil, a stencil frame, a roller, one color paint, a paint tray and a stirring stick. I ordered a few extra paint colors and some brushes for detail work. There are also tassels and other embellishments for some extra bling. I opened my box of treasure and everything was tucked neatly inside, including their very cool stenciling frame, which locks the stencil and pillow cover in place, so there is no moving or gathered fabric. The box also included an instruction sheet. I have to say, I did not encounter any of those problems. At all. It was ridiculously easy to do and I had so much fun. The cover and stencil came out of the box, already put together, and ready to use. The clips held the stencil in place perfectly. I opened my paint, stirred it up, loaded it on the roller and got to work. As suggested, I used a small brush to finish the edges and do the detail work. 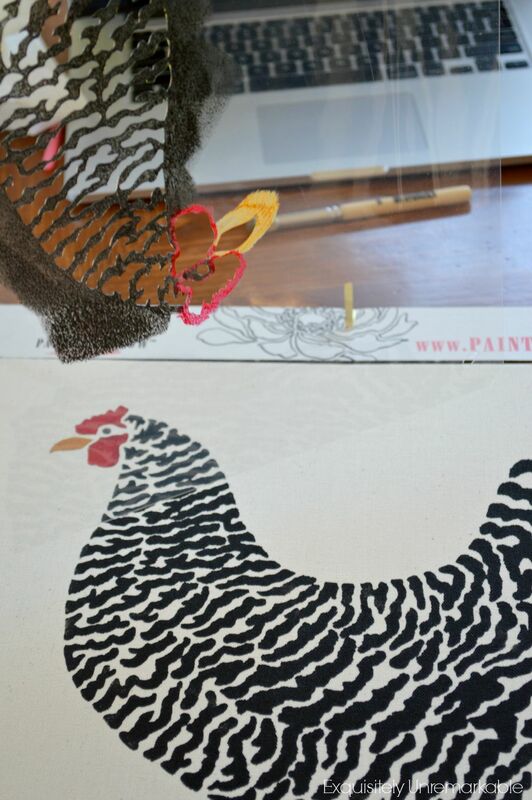 When rooster number one was complete, I just unclipped the stencil from the frame and lifted the pillow cover out. Then I grabbed the next pillow cover. I laid it inside the stencil frame, locked it down and started painting again, this time in brown. I recommend ordering an extra roller cover if you are going to use more than one color. For less than a buck, it will save you the trouble of washing and waiting for it to dry. I let both covers sit for a bit before removing the cardboard. Then I stuffed them with the included inserts and my fluffy buddies were born. I have to say that I was super impressed with the kit. It was literally a foolproof way to make a designer pillow...or two! I think I'm obsessed with stenciling all over again. What do you think of my new friends? Would you paint a pillow? *Paint-A-Pillow generously supplied me with everything necessary to create these two lovely DIYs. Of course, all opinions are my very own. 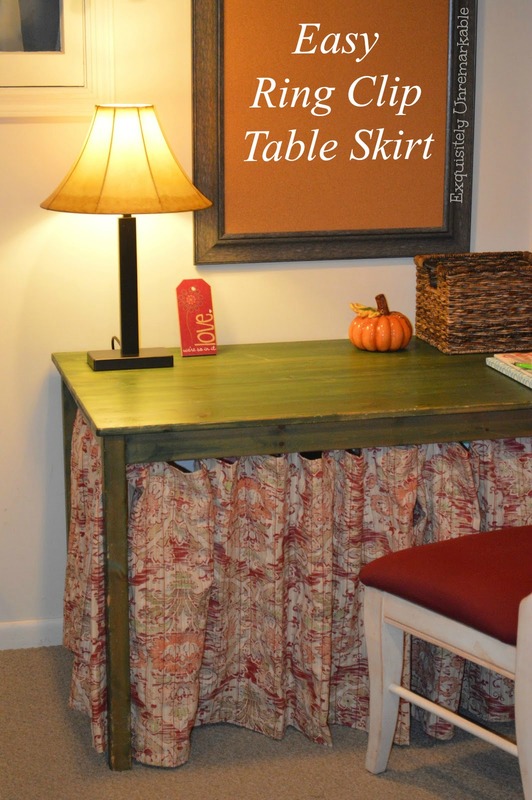 Check out my other super easy stencil, paint and sewing projects! 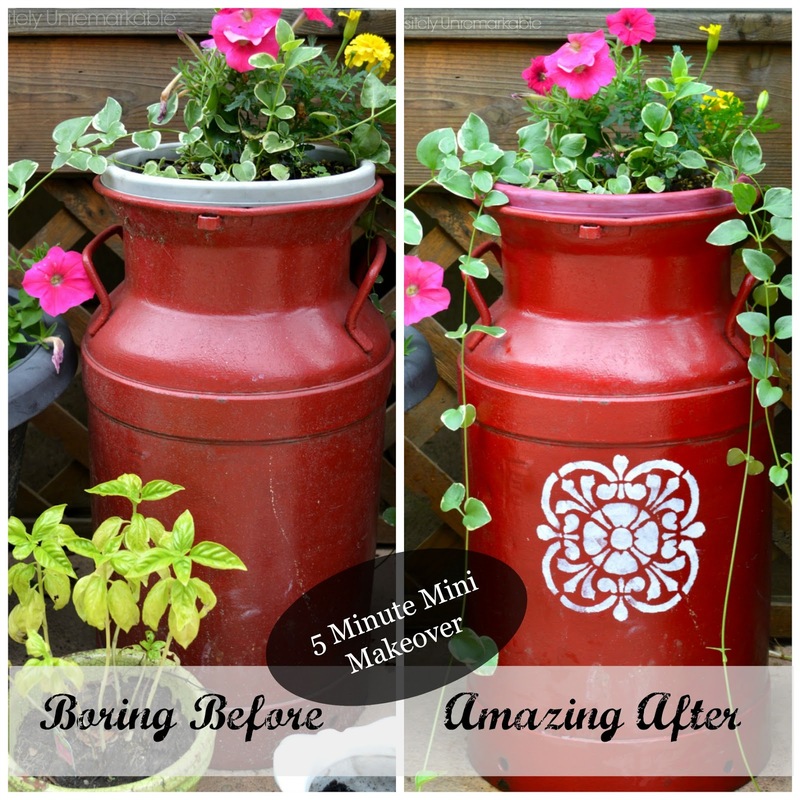 Very cute and it looks like a great way to stencil. Glad to see that as a craft stenciling appears to be making a comeback. I want Pinecones, Snowflakes, Little Birdie, Birds in Trees! It is sad they have no fall stencils, like falling leaves or something! You did an awesome job! 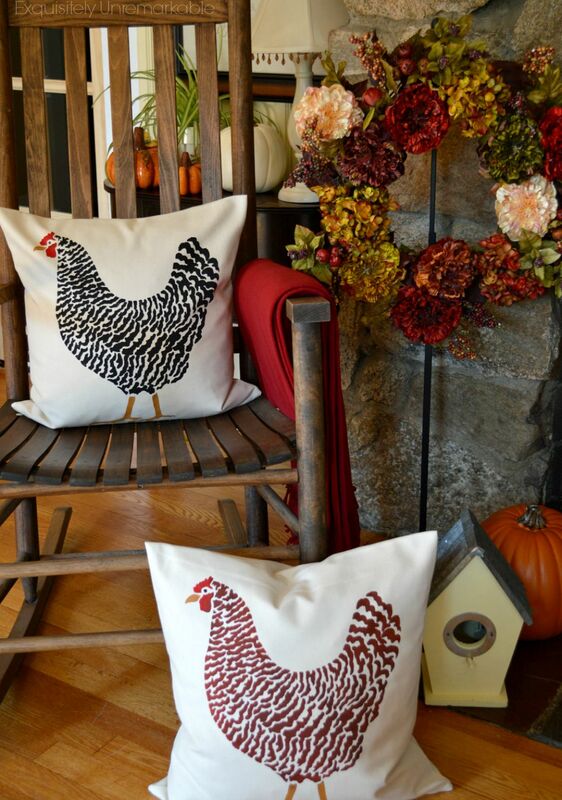 Nancy, maybe you could use the Spring Songbirds pillow or the Virginia Creeper and paint the leaves in rustic fall colors. That might give you the look you're going for! I didn't see the Virginia Creeper! Let me go look again! Hi Kim, Love your painted/stenciled pillows. 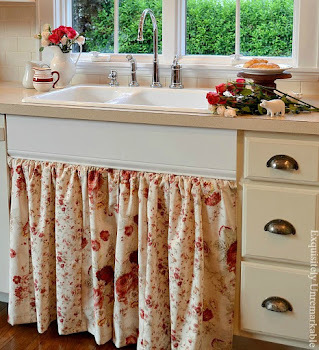 These are incredible and so country farmhouse perfect. I have painted on fabric for years and stenciled too. So glad you enjoyed the process on fabric too. This looks like a great system and generous giveaway. I love your pillows and I will continue to paint on pillows. Thanks for sharing. Cute cute cute. Very Fresh! Finally a project I can actually do! I love this and will be making it soon. I am all about easy projects, Ali...I don't do difficult! This was so easy and totally foolproof. I am sure your pillows will be beautiful. Kim, I went through the same stenciling stage --all of my walls and furniture! I love how your pillows came out--too cute! I NEED THESE PILLOWS IN MY LIFE!! I also have a rooster obsession....along with chickens and cows. And I'm ok with that! Your pillows are adorable! I've been afraid to stencil on fabric for the very same reason. These are so cute. Great job. I use to do stencils back awhile ago. Glad to see they are coming back around. My dad loves roosters. We have him a burlap bag that had a stenciled rooster on it and the bag had white lights in it. I love them! But they look like hens to me...which I like better than roosters. That's funny! Me too. 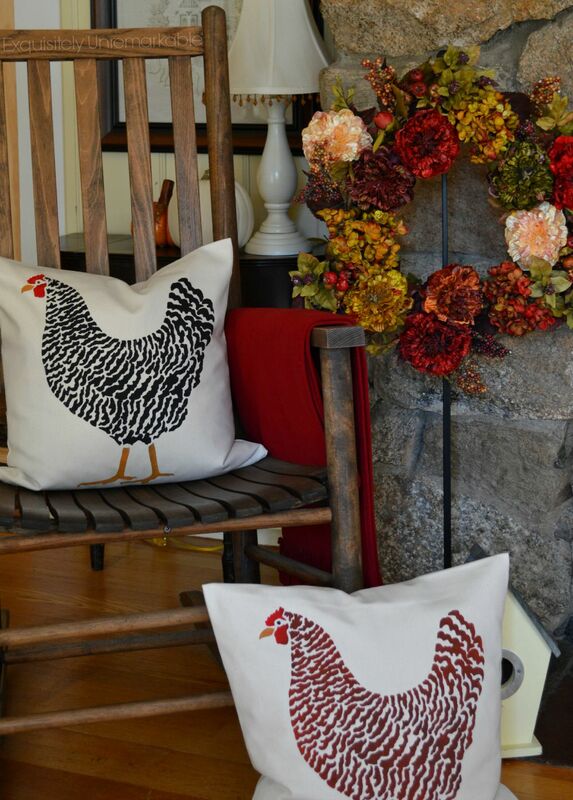 I kept calling them my chicken pillows and my kids kept saying, "Roosters mom!" Judy, thanks for the kind words. I really had fun with this DIY. It was the kind of project where I was sad it was done. I just wanted to keep playing! Definitely come back on Thursday!! Good luck! Hey, this old Iowa gal says ... chickens, but whichever, they're very cute. I'll be back on Thursday, but meantime I'm headed over to check out their website. I have lots of talented readers who will like these! Well, I can't argue with an Iowa gal when it comes to chickens, that's for sure Cheryl! 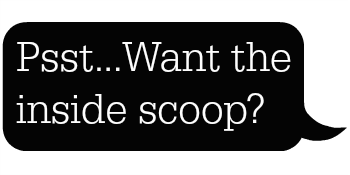 ;-) You're going to love the website, lots of inspiration and pretty over there!! Oh my goodness, so, so cute! Thank you for sharing! Oh-mi-gosh this brought back the memories! I stenciled like crazy years ago on walls and such....love these! 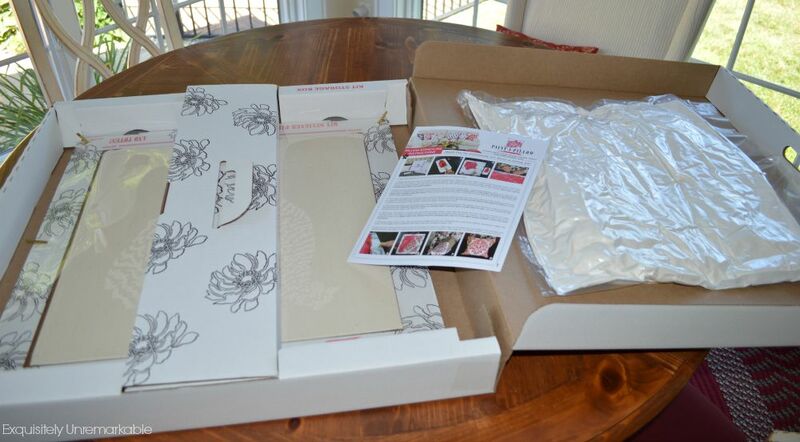 You know Jane, I had so much fun stenciling and creating myself, that I never thought of giving a kit away as a gift...but wow, what a fantastic idea!! :) Fabulous!! What a great idea, the pillows are beautiful! Thanks so much! Come back on Thursday and enter to win your own! Love the pillows. You did an awesome job on them. Thanks Judy! I really had fun with this one! :) I'm ready to get my fall on now! I love these pillows and you did a fantastic job. I'm going to check out their website for sure. These are definitely hens though, not roosters, but they are awesome and adorable! I love this idea! That rooster pattern is just so cute and yours came out great. I'll be back Thursday for the giveaway! This is ADORABLE! I pinned it to make it for sure! I love getting pinned, Cari, thanks!! Love these roosters! Instantly thought of my mom when I saw them. I think I will make her these for a Christmas gift. Thanks for introducing me to Paint-a-Pillow :) P.S. Love your blog. So cute Kim and it looks like it would be a fun project to do! I'll be back to enter for sure. Thanks Kristi! It was very fun and very easy to do and look like a pro. I love stencils and I just love, love your pillows! Looks like so much fun. Great post, Kim! Those pillows are so super-cute, Kim! I've never done much stenciling of any kind, but I am intrigued. How fun that the company contacted you.....they certainly chose the right person! Thanks Carol! I am absolutely thrilled with my new pillows...and it was a great crafty DIY. The results are elegant and totally custom. Can't do better than that! Hi Kim, wow I love your cute stencils you made on the pillows. The chickens are really adorable and you did a great job! SO adorable!!! Would LOVE to win!!! Cute pillows! I am thinking this would be a fun project to do with my kid! I wonder if they wash well? Thanks Rue! The company suggests setting the paint with a heated iron if you are going to wash them. I did not do that, but they say it works! Enter! I want to see you master a project. You can do this one...I promise!! Your project turned out great! I love this pillow idea though, I am so checking out their other patterns! Love the ones you did, and in the two colors they look amazing together! I am sorry I stopped Kimberley. I really forgot how much fun it is. I am going to be stenciling everything now...thanks for the sweet comment. I really do like my new pillows. Thanks Lynn! I really enjoyed the process. Your new pillows turned out great! 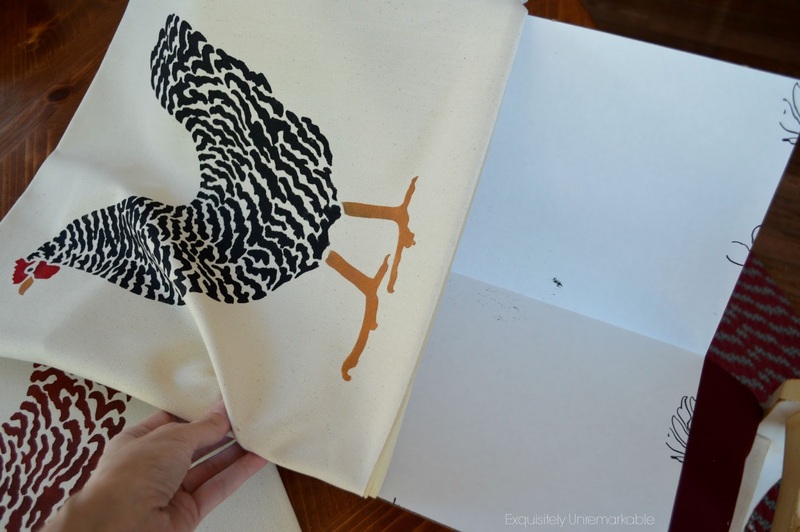 I'm an avid textile stenciler, and am thrilled to have found a new resource! I love to do two layers of fabric (top layer stenciled), hand-quilt them together, and then cut out / remove some of the top fabric. Basically a reverse or negative reverse appliqué. It's a slow but rewarding process! Thanks for introducing this site! Lovely work. It’s sounds like a beautiful process, Susie. You are a master crafter! I really appreciate your sweet comment and your visit. I hope you enter the giveaway. I bet you could make something fabulous from their kit. I also went through a big stenciling phase. Several rooms in our home still have stenciled borders. I love these pillows. They turned out beautifully. Thanks for adding this to the Bloggertunities share thread. I'm sharing this post on this week's Friday Faves. Thank you for featuring them Laurie! I am so excited to be included among so many creative fall ideas! Kim, they are darling! 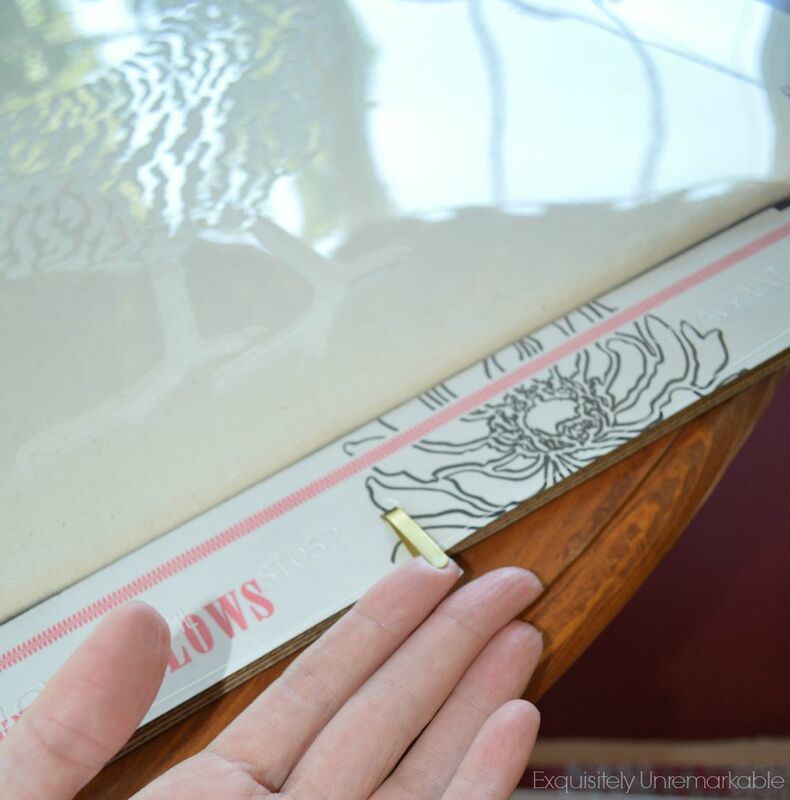 I have always loved stenciling and I too had stenciled borders in my home. :) I have stenciled on fabric quite a bit, but this kit is really quite fabulous. The roosters are so sweet! Thanks for sharing with SYC. They are adorable, Kim! You did a fantastic job, as usual! This is probably one craft I wouldn't be too intimidated to do. Thanks for sharing and have a lovely Sunday! This is a great idea. I love your chicken pillows, and the thought of simply rolling on the paint amazes me. I saw your link at Courtney's Feathered Nest Friday Link Party. It really was simply rolling the paint in Ann Marie! SO easy. I hope you entered the giveaway! It really changed my mind, Nancy. The frame made it so easy to do…now I’m hooked!! :) We may get overtaken by pillows! That is such a great stencil! I love the detail of the chicken feathers. Thanks Michelle! 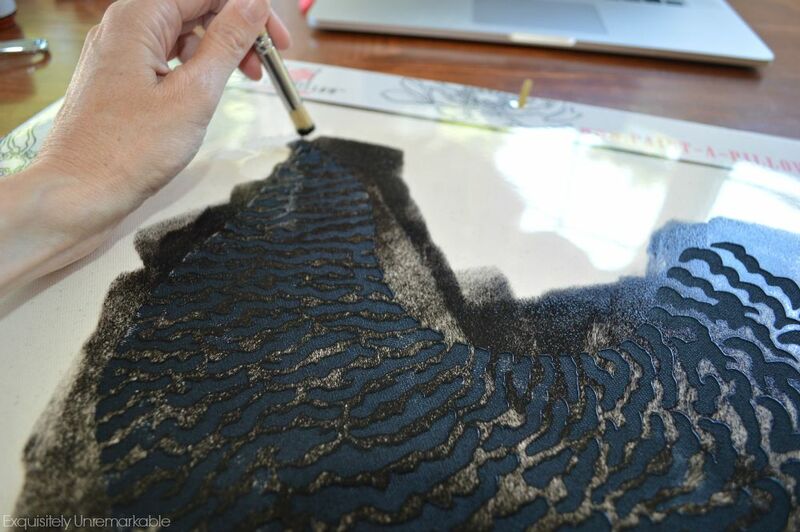 It was so easy to do, just roll the paint on and the details magically appear! I hope you enter the giveaway! OMG!!! How absolutely adorable are these!!! And with Christmas on the horizon,they would make great gifts! Wow, what a handy fun way to make some fun pillows! I have many stencils, and have never gotten brave enough to use them on fabric either, for the reasons you mentioned. Hmm... maybe I need to give them a re-run, lol! The rooster design you chose is awesome too! Thanks so much! I never gave away my stencil collection and now I am very happy about the chance to use them again! :) Thanks for the visit! So, so pretty and looks oh-so easy! Oh my goodness! I LOVE these! We have hens and roosters at our cottage and I love them! I'm going to check out this stencil right now!